Liberos, defensive specialists and back court players improve volleyball digging and defense efficiency by practicing with someone better, using pepper to improve ball control and aggressive court attitude. 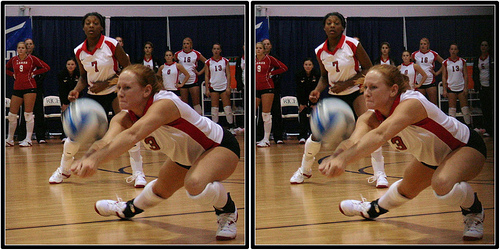 Volleyball digging is the last line of defense used to keep a ball attacked by the opposing team from hitting the floor on your team's side in an effort to score a point in a rally. Digging hard hit spikes and covering a lot of back row court area and doing it well is important to your coach so that should make it very important to you, if you want to improve your volleyball game and be a six rotation player who can play the entire game without having to come off the court. encourage a more aggressive defensive attitude while playing in the backrow. When you get the chance to play Pepper with a guy with good ball control skills, do it. Always. Playing with a male or someone bigger, better or stronger than you are, makes you learn how to be a better, stronger, faster defensive volleyball player in a shorter amount of time. I have coed Boot Camp classes on purpose so that girls learn to pepper and defend against bigger faster guys their age or older. Guys hit harder and move faster and have an aggressive attitude that girls need to adopt while digging and playing defense. Surround yourself with people/players who are better than you are, learn from them and have them make you work hard and challenge you and you will become a better volleyball player alot faster. Use the pepper drill to increase your game focus and concentration during warm-ups. Here's your chance to ignore pre-existing pre-game distractions like playing in a venue with a small court, warming up in a confined space, balls flying around the court in your pepper zone, or team benches. You have to narrow your focus and concentrate on the ball. The ball you get and the ball you give in pepper practice gives you a chance to do that. Focus on getting the ball right to your partner and keeping up the intensity of your pepper warmup, even if you have to do it with alot of distracting elements happening around you. The better you get at increasing your focus in warmup, the better you get at focusing and concentrating and being able to narrow your focus during a game. This way crowd noises, whistles, opposing fan noise, referee interruptions, cat calls and other game time distractions will have little effect on you. During pepper, raise your elbow, keeping it above the level of your ear while you control the ball and gradually increase the power hit to your partner. Hitting the ball with a low elbow in pepper means you increase the chance you’ll hit the ball low in hitting warm-ups and continue hitting the ball low in a game. Pepper warmup is one of the best opportunities for you to practice the individual volleyball digging and hitting skills using the correct technique you need to improve your game. Every opportunity you have to touch the ball should be used to contact the ball correctly. Many players take pepper for granted and since the ball is coming at them slowly, they flake, and ignore using the proper technique. They start hitting the ball lowering their elbow instead of hitting the ball the way they would when they are at the net. In boot camp classes we make sure players remember... Bending your knees so your hips are below the level of the oncoming ball, keeping a straight platform with shoulders over your knees while digging. Passing the ball with your legs, setting the ball high giving your partner time to swing and reach high to hit back at you... all these volleyball digging and hitting techniques should be practiced in your pepper warmup so that at game time-- you've already performed these skills so many times that that your muscle memory is automatic and you begin to perform these skills the same way you need to perform them in competition. 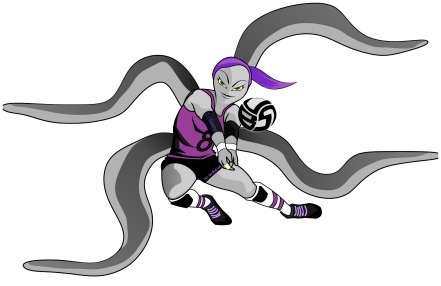 Learn more about Digging and Defense by clicking the Related Links below. .
Before leaving this page Say "Hi" to Miss O.I Gotchu the Octopus wearing the #8 jersey below. Miss O.I. is the libero for the All Beast VolleyBragSwag All Star team. Miss O.I. Gotchu, the volleyball libero for the All Beast VolleyBragSwag All-Star team.